Atari's revealed that RollerCoaster Tycoon 3D is on hold. A representative from the publisher confirmed to Nintendo World Report that it has no immediate plans to release the game, despite earlier claims we'd see the game in March this year. Atari's not revealed why it's deciding not to release the game but hopefully we'll see it brought to market later on this year. Well, I'm not interested in this anyway, but shame to see a game put on hold none-the-less. i played the first one,never touched any 3d versions. kinda liked it for a while, but never got the same longevity as simcity 1 or 2000. I was interested in this, but I found the original game and its two expansions for $3.00 online around Christmas. That's enough Roller Coaster Tycoon for me. @6ch6ris6 Same, I hope this doesn't get cancelled. 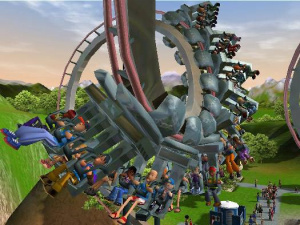 I loved playing the RCT games when I was younger. While it would be nice to have such a game on the 3DS i guess i wouldn't pay more than a budget price anyway. And i reckon i'm not alone on this. I really can't think of new features good enough to make a large number of people excited for it. Aww. Was looking forward to this - haven't played a game in the series but loved Sim Theme Park aka Theme Park World. They had an ad for this game inside the Centipede: Infestation box too... ah, jeez. Sim Theme park was my favorite. Seemed to have more life to it, and not feel so lonely. But besides that, I would still love to see this game on my handheld. GAAAAAH. RCT2 is one of the best management sims, ever. This hurts my feelings. I hope it just comes out in late 2012/early 2013 and not get cancelled. Atari should say what the reason is, if it's financial reasons then I'd gladly support them by buying the 2 DS Atari classic compilations. I was actually looking forward to this. Hopefully it will be released at some point. I still play the original RCT from time to time, so I'm sad to see this. Here's hoping it's only temporary. I found out they were making it not from NL but from a guy in class who was even more excited about this than I was, so the market is there. I hope this game was just put on hold for them to fix up some things. I don't want this game to be cancelled. I love the Roller Coaster Tycoon series. I have all 3 games and their expansion packs, except the ones for the first game aren't working anymore. Ah the RCT series. That takes me back... Too bad it's on hold/possibly cancelled. I might have picked it up. oh no I hope it will not be cancelled! I think Atari is having tough times though, this may be more a sign of the trouble Atari is having than anything. I hope they use their time for perfecting the game. The 3DS seems like a perfect platform for a portable RCT. Didn't even know there was one coming out. This saddens me. Roller Coaster Tycoon 3D doesn't fit their current portfolio of releasing a game and selling level packs to you. My guess is Roller Coaster Tycoon had too much content for $29.99. I'll be interested in it once I find out if Chris Sawyer is involved with the project. Dang, oh well gives me time to save up if it ever comes. I love these games and was probably going to buy this. I lost 3 and 1 is small on my screen. FUUUUUUUUUUUUUUU I was really looking forward to this. Crap. For a budget title I was looking forward to this. Never did get to play the sequels but loved the original back in elementary, still play it once in a while. This is a must buy for me. Actually I would have bought the 3ds just for this one game, I like it ThAT much. I know several locally that feel the same way... Come on Atari, we're counting on you.. please..